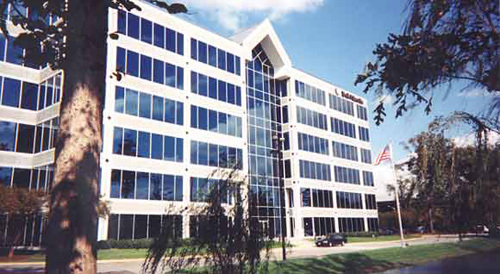 Bell Atlantic planned to build a 6-story office building in Virginia Beach. The proposed site of the building was underlain by relatively loose clean to silty sand, overlying medium stiff clay. Initially, driven piles were considered for support of the building, but the depth to suitable bearing was on the order of 40 feet. Dynamic compaction was selected instead due to the relatively low cost. The dynamic compaction was done using a 9-ton weight falling about 50 feet. Due to the relatively shallow groundwater table (only 5 to 6 feet below the existing surface), the building area was compacted in several phases. The compaction was sequenced so that a minimum of two days elapsed between phases in any area to allow elevated pore pressures to dissipate. Because increased pore pressures created by the dynamic compaction caused water to flow into a number of the dynamic compaction craters, select clean sand was used as backfill. Post-compaction SPT testing was delayed for a week after completion of the dynamic compaction to lessen the influence of elevated pore pressures on the test results.